I mentioned in my previous post that I went on vacation. And what would a vacation be without some photos to share. My wife and I went camping at Blackwoods Forrest campground in Acadia National Park In Maine. It was an amazing trip. I had never been exposed to scenery like that before in my life. I would greatly recommend anyone to go there. One of the things that made the trip so enjoyable is our campsite was within a short walk of the coast so we could walk down anytime. We simply followed a short trail and then crossed the park loop road and we were right on the coast. 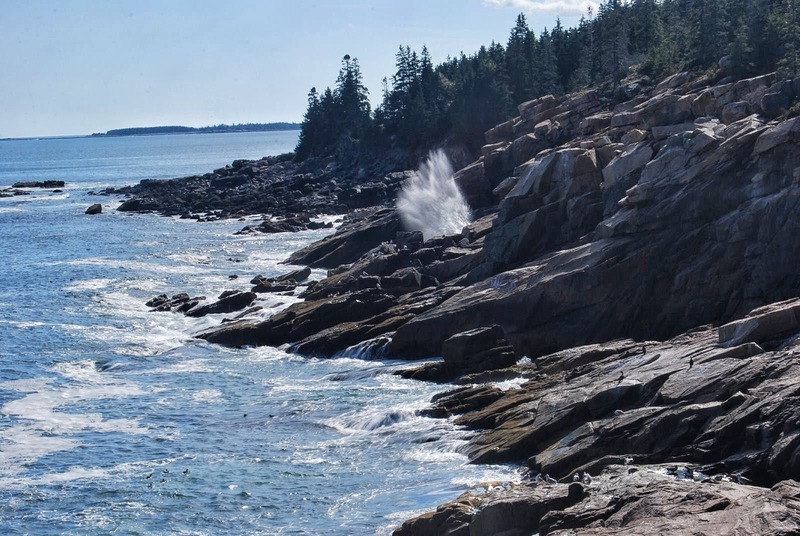 Now for anyone not familiar with the coast at Acadia it is quite different than one might imagine when they think about a typical coast line. When walking out to the coast we found ourselves a good distance above the ocean on rocky cliffs. This made for a spectacular view. We were able to see up and down that stretch of coast and across to the far shore. It was amazing to watch the waves crash on the rocky cliffs. If you are there at the right time in the right place you can see giant sprays of water shoot up between the cliffs. I was lucky enough to experience this awesome sight. I was also lucky to have my camera there. This image is from the coast near our campsite on one such occasion when we could see the waves crashing and shooting up into the air. The exposure isn’t the greatest to me but I love how the plume of water shooting up came out. It was not the easiest shot to get. I couldn’t actually see where the waves were hitting that were creating that water spout. So I had to just try to time it or wait until I actually saw the water shoot up. And the waves weren’t always strong enough to send the water skyward. It was cyclic. So once the pattern of water spouts started there was only a limited am mount of time to get the shot or you had to wait for the next cycle of waves with enough force to push the water into the sky. It was nice to have such a great landscape feature so close to where we were staying. My only regret is that I didn’t get to see more of the park and surrounding communities. I would love to go back some day.